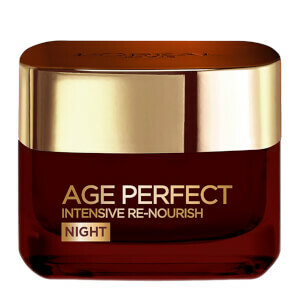 Regenerate your complexion with the L'Oréal Paris Age Perfect Intensive Renourish Manuka Honey Day Cream; a rich, lightweight formula to repair and revitalise mature, dry skin. Fortified with Vitamin B5 and Manuka Honey (a powerful raw ingredient that is concentrated in essential nutrients and minerals), the quick-absorbing, anti-ageing cream helps to enhance the skin's density and barrier function. The luxurious day cream leaves skin looking smoother and more refined with improved suppleness and elasticity. Ideal for mature, dry skin. Påfør i cirkulære bevægelser for bedre absorbering på et grundigt renset ansigt og helst mens du undgår øjets kontur. Aqua / Water, Paraffinum Liquidum / Mineral Oil, Glycerin, Isocetyl Stearate, Hydrogenated Polyisobutene, Cyclohexasiloxane, Butyrospermum Parkii Butter / Shea Butter, Cera Alba / Beeswax, Cetyl Alcohol, Glyceryl Stearate, PEG-100 Stearate, Mel / Honey, Hydroxyethylpiperazine Ethane Sulfonic Acid, Prunus Armeniaca Kernel Oil / Apricot Kernel Oil, Zea Mays Oil / Corn Oil, Mel Extract / Honey Extract, Cera Microcristallina / Microcrystalline Wax, Paraffin, Royal Jelly Extract, Isobutane, Sorbitan Oleate, Sorbitan Tristearate, Calcium Pantetheine Sulfonate, Dimethicone, Copernicia Cerifera Cera / Carnauba Wax, Isohexadecane, Sodium Hydroxide, Ascorbyl Glucoside, Disodium EDTA, Propylene Glycol, Caprylyl Glycol, Citric Acid, Passiflora Edulis Seed Oil, Xanthan Gum, Polysorbate 80, Acrylamide/Sodium Acryloyldimethyltaurate Copolymer, Acrylonitrile/Methyl Methacrylate/Vinylidene Chloride Copolymer, Oryza Sativa Bran Oil / Rice Bran Oil, Tocopherol, Ascorbyl Palmitate, CI 15985 / Yellow 6, CI 19140 / Yellow 5, Linalool, Geraniol, Eugenol, Coumarin, Limonene, Citronellol, Benzyl Alcohol, Parfum / Fragrance.